The Little Red School house is a great spot to come for a romantic getaway for couples, a country retreat, an artists paradise, a writers lair or a solo trip for stress relief. The accommodation was once a school in the 1920s so while it has historic notions, it also has a modern kitchen with full facilities, flat screen tv, queen size bed, free WIFI and a washing machine. The accommodation is located on our 940 hectare family farm which we run sheep and beef cattle. The farm is situated over 400m above sea level so has fantastic views of rural landscapes, mountains and the ocean. An early morning or evening walk is amazing for taking in the sunrise or sunset. Our area is the pinnacle of true farm living. If our guests choose, with prior arrangement, they can have a taste of the farming lifestyle as we love to share what we are passionate about as the farm has been in the family for four generations. There is a fantastic water hole close by which is great for swimming in the summertime and our roads/tracks are known for some great bike riding experiences. Oamaru which is a 30 minute drive for us offers the famous historic Victorian precinct, great walkways, an aquatic centre, Clarks Mill (historic flour mill with original machinery), Totara Estate (historic farm), Oamarus Prehistoric World, Steampunk HQ, Blue Penguin Colony, Ten Pin Bowling and our famous Whitestone Cheese Store to name a few. In the other direction we are only a 30 minute drive from Duntroon which is home to the Vanished World Centre and 45 minutes from Kurow which hosts some great wineries. And if biking is your thing, then the Alps to Ocean cycle trial is a must. It starts at Mount Cook (the highest mountain in New Zealand), goes past the great lakes and rivers and ends in Oamaru. We are happy to collect any guests and their bikes from the Duntroon to Oamaru section of this trial. - Smoking allowed outside only. - We have a queen sized bed in the accommodation and a sofa bed. A portacot is available that we can add in the room. 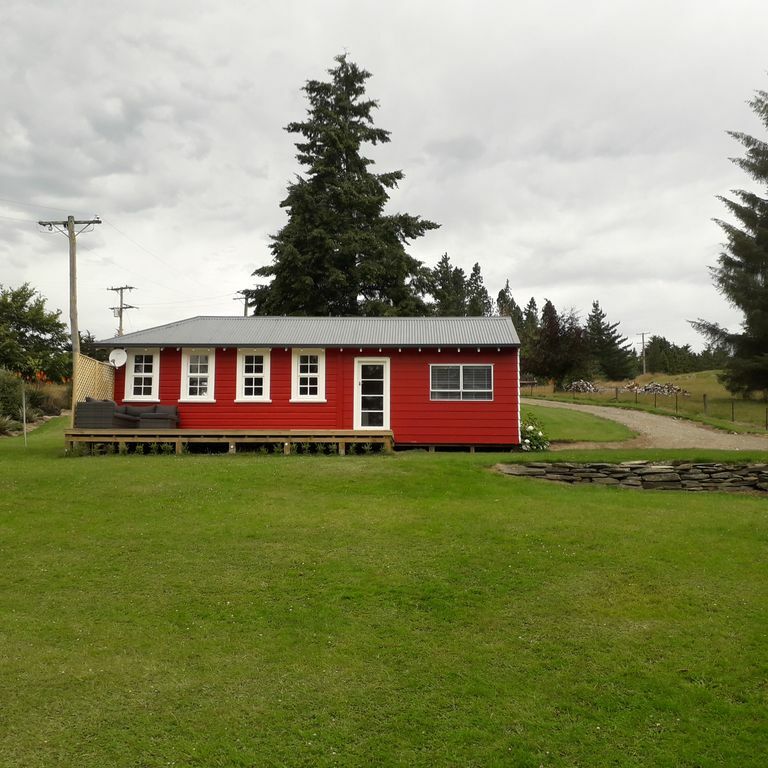 - The farm is a working sheep and beef farm, so we ask guests to stay within the fenced property of the Little Red School house unless they are with us or have our permission once we have advised of any safety hazards. Greg and myself are passionate about our little piece of land that we are lucky enough to be guardians of for the time being. Greg is now the fourth generation of his family to be on this farm. Together with our three children ranging in ages 5 to 15, we enjoy the challenges, the rewards and the lifestyle of sheep and beef farming. The Little Red School House was originally a school that operated at Fuchsia Creek (about 18kms away) from 1925- 1949. In the 1950s it was shifted to its current location to be used as Shearers Quarters. It was left untouched until 2007 when a bathroom was added and was renovated in 2017 and opened up as accommodation. Immerse yourself in the farming culture by experiencing day to day farm life or a 4 wheel drive trip, horse riding, watching sheep shearing, dog trialing, a ride in a side by side motorbike, star gazing, visit the pet sheep, Roger the goat, the cows or collect fresh eggs from the chickens. This location is set on a 940 hectare rural sheep and beef property. If you walk or drive up the Turnbulls Road a few kilometres, there are stunning views from the mountains to the ocean. Beautiful to watch the sunrise or sunset. Tennis rackets are available and can be played at the local school (13kms down the road) when the school is not in use. The accommodation is very pleasant and reasonably well equipped. The accommodation is very pleasant and reasonably well equipped. It was wonderful to find accommodation with a teapot! The cottage is very tastefully finished, with a great bed, good cooking facilities, a comfy couch and a generous bathroom. The rural setting is beautiful and peaceful, and offers the potential of pleasant walks. The complimentary breakfasts were an unexpected surprise. Very good WiFi completes a generous package. We loved our stay here, would totally recommend for a peaceful getaway. A gorgeous place to stay and the peace and quiet very restorative - enjoyed meeting Roger the goat! Lovely location and lovely and very tidy house.